The nascent Internet sector has contributed five per cent to the growth of India's gross domestic product (GDP) in the last five years, according to a McKinsey report released at the e-G8 Forum held in Paris on May 24-25, 2011. 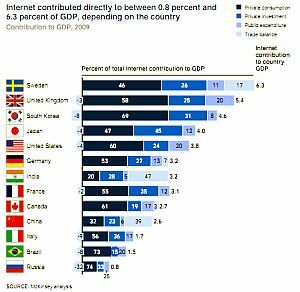 Public expenditures on the Internet were at 5 per cent of the total GDP contribution in India, compared to more than 20 per cent in the UK, USA, Brazil and Russia. McKinsey Global Institute and McKinsey's Technology, Media and Telecommunications practice has published 'Internet matters: The Net's sweeping impact on growth, jobs, and prosperity', a report that offers the big picture on the impact of Internet on the world economy. It used a combination of a macroeconomic approach using national accounts; a statistical econometric approach to get the correlation between Internet maturity and GDP per capita growth; and a survey of 4,800 small and medium sized businesses in 12 countries. According to it, there are 2 billion Internet users worldwide and as a sector, Internet-related consumption and expenditure is now bigger than agriculture or energy. Internet currently accounts for 3.4 per cent of GDP in 13 countries. In mature countries, it accounted for 21 per cent of GDP growth over the last five years. Calling it a "catalyst" for job creation, the report notes that among 4,800 small and medium sized enterprises surveyed, the Internet created 2.6 jobs for each lost to technology related efficiencies. India is strengthening its position in the global Internet ecosystem with a growth rate of over 20 per cent. The report states that India accounts for over two thirds of IT services imports to developed countries from developing countries. "This success was built on a thriving Internet ecosystem supported by public policy and private investment across human capital development, infrastructure, business environments and financial capital," the report reads.